Turtles are everywhere in and around the Dry Tortugas National Park. Named "Las Tortugas" by Ponce de Leon in 1513, this scattering of small sand and coral islands approximately 70 miles west of Key West, Florida, are famous for the abundance of sea turtles that annually nest on them. Some say that sea turtles are today's only living relics from the prehistoric past. Loggerhead, Hawksbill, and Green turtles sometimes are seen floating in the sea on the trip between Key West and the Dry Tortugas National Park. For hundreds of years Green turtles have provided fresh meat for mariners, pirates, and peoples living in the Florida Keys, Cuba, and all around the Gulf Coast. At one time turtling was a big business for Key Westers, with a cannery brewing popular green turtle soup that was shipped out to northern cities. 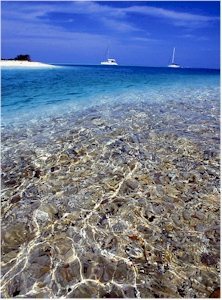 The Dry Tortugas National Park is the most active turtle nesting site in the Florida Keys. Park Service biologists have been monitoring sea turtle nesting activity within park boundaries since 1980. They survey the park's seven islands daily throughout the nesting season and document the presence of turtle tracks or "crawl." When researchers find a specially-shaped mound of sand on the beach, they know it is a nest. Each nest is marked and recorded. Forty-five days later the nest is checked for signs of hatchlings. Three days later, researchers excavate the nest, release any trapped hatchlings, and record the number of eggs. Over 2,330 Loggerhead and Green turtle crawls have occurred during the last four seasons on only three miles of beach!